Young children will love Stanley’s Diner. Stanley cooks and his friend, Hattie, works in the front of the diner, while friends, Myrtle, Charlies, Gabriel, and Little Woo come in to eat. Stanley is in the back cooking eggs, tomatoes, and mushrooms when Myrtle arrives for breakfast. Stanley whips her up a plate of eggs with toast, and Hattie adds a cup of hot coffee, before serving it to the hungry Myrtle. Stanley sure looks happy using his 8-slice toaster. He smiles while watching the 8 pieces of bread pop up into the air when toasted just right. After the lunch crowd—including Charlie and Gabriel, eating pancakes with syrup—leave for their own afternoon activities, Stanley slips out of the diner. Driving his blue pickup truck—matches the blue of the diner—Stanley makes a special trip to the market. The chef buys cocoa, flour, butter, sugar, and milk. 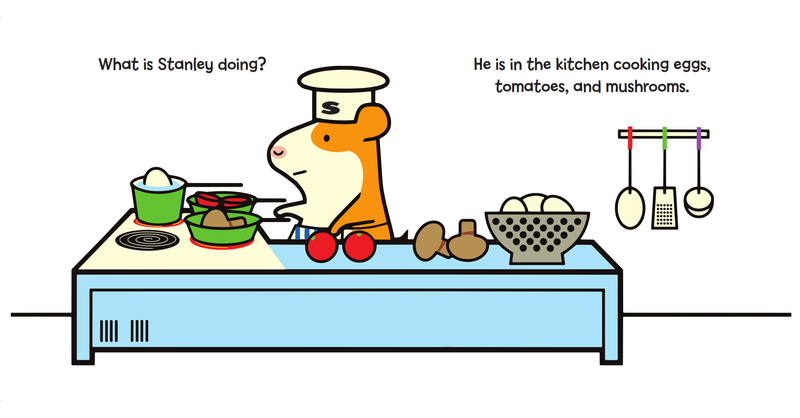 Stanley is baking something special with those ingredients from the market. Now, what could Stanley be making, and for whom is he baking? Each Stanley book has a basic color scheme. For Stanley’s Diner that color is light blue. Bee uses large, easy to recognize basic shapes to build his images, separating each shape with wide, black lines that not only draw your attention to the images, they also deepen the colors used by Bee . If asked, kids should be able to recognize the shapes, the primary colors, and the secondary colors used in the Stanley series of books. The digitally created images continue to smartly use white space, as Bee does in all previous Stanley books. This white space helps keep the eyes focused on the illustrations. I also love the clean presentation. 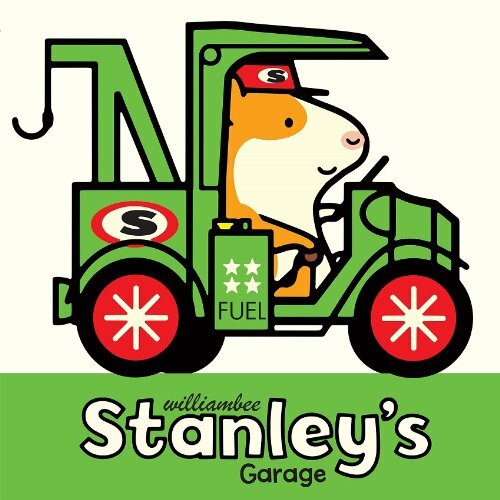 Young children will enjoy learning about the jobs Stanley takes on in this series. 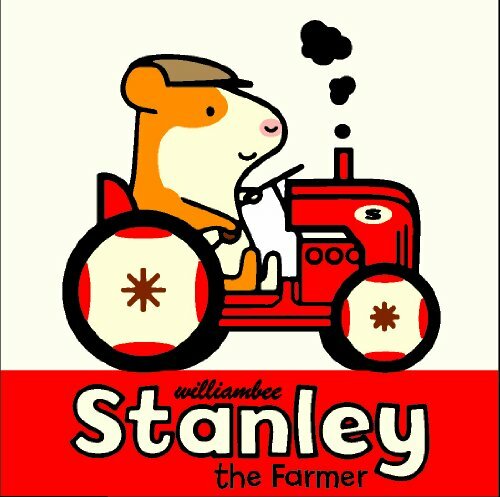 Along with being a chef in a diner, Stanley has built a house, run a garage, and grown food as a farmer. What other jobs Stanley might take on in the future is anyone’s guess. After reading Stanley’s Diner, young children will wonder what mom and dad cook in their own kitchen and what chef’s make in the restaurants they frequent. 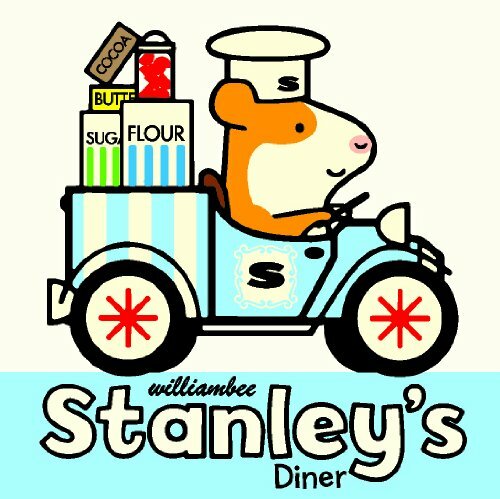 Stanley’s Diner can help young children prepare for kindergarten, as they learn colors, shapes, and new words. Each story in the Stanley series stands on its own and highlights a different occupation. 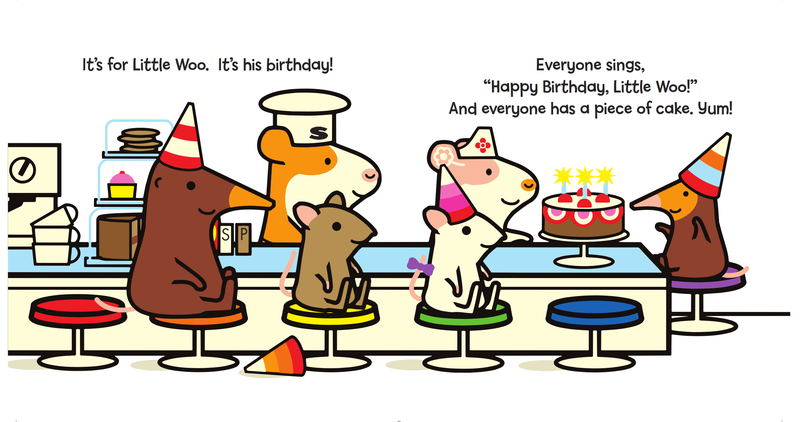 Stanley‘s Diner is a great choice for story-time. The illustrations, thanks to those black lines, are easy to see from a short distance. Hopefully, Stanley has more adventures on the way. Young children will be eagerly waiting to hear the news of a each new addition. STANLEY’S DINER. Text and Illustrations copyright © 2014 by William Bee. Reproduce by permission of the publisher, Peachtree Publishers, Atlanta, GA.
***Originally published in 2014, titled Stanley’s Café, in Great Britain, by publisher, Jonathan Cape. Purchase Stanley’s Diner at Amazon —Book Depository—IndieBound Books—Peachtree Publishers. Learn more about Stanley’s Diner HERE. Stanley’s Garage reviewed HERE. 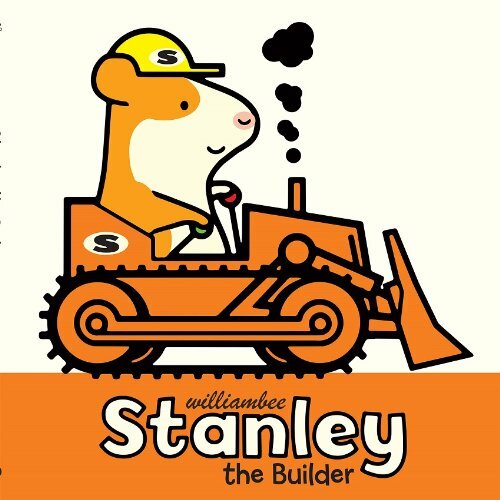 Stanley the Builder reviewed HERE. STANLEY’S DINER. Text and illustrations © 2014 by William Bee. Used by permission of Peachtree Publishers. Thanks, Erik. I love the colors being used for each book. Can’t even say why, but I like the colors. This looks like a very interesting and fun series. I love the color theme of each book. 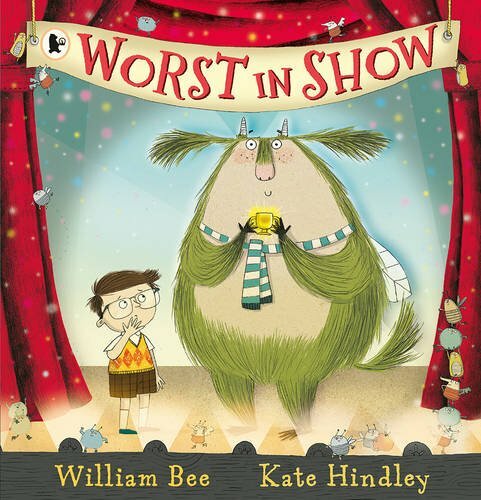 Definitely books that young readers will want to look at again and again. I love this series. Haven’t seen Stanley’s Diner, which sounds like great fun! But, have purchased Stanley’s Garage and Stanley the builder for our grandson. His grandpa owns a several service stations. Cars and trucks are favorite choices. Will check this one out! Stanley’s Diner and Stanley the Farmer are Fall 2015 releases. Hopefully, there will be more Stankey books, but I haven’t heard anything as of yet. They are terrific books for young boys (and girls). One thing I meant to say in the review but didn’t: The cover is tacitly interesting with its puffy, softness instead of a hardback fell. It is still hardback, but the front is stuffed with something fluzzy. Stanley’s Store and Stanley the Mailman are the next two out. The first in Spring 2016 and the latter in Fall 2016. So there are more. Who-oo!